When Gregory Zullo refused a Vermont state trooper’s request to search his car, it got towed and he was charged $150 for the tow. Later, a search warrant was issued for the car but police found nothing illegal and no charges were filed against Zullo. Zullo, who is apparently still out the $150, is suing with the help of the American Civil Liberties Union. Vermont cop seizes man’s car because he saw eye drops and dog ‘smelled’ pot. FBI director James Comey is concerned that Apple and Google are making phones that cannot be searched by the government. Let me join with the Founding Fathers in telling the Director to Bite me! If he wants to know what I’m doing with my phone, he can get a warrant, just like the Constitution provides. FBI: new Apple, Google phones too secure, could put users ‘beyond the law’ – Yahoo News. In the six months since stepping down as secretary of state, Clinton has addressed apartment-complex developers in Dallas, private-equity managers in Los Angeles and business executives in Grand Rapids, Mich. Still to come are travel agents, real estate brokers, clinical pathologists and car dealers — collecting more than $200,000 per appearance, according to one executive who arranges speaking tours. The question then is whether Hillary, viewed as the presumptive frontrunner for the Democratic nomination in 2016, is on the same page as her husband or the party. Given her post-State career, I’d guess the former. Hillary Rodham Clinton keeps busy giving paid speeches to industry groups – The Washington Post. When itinerant preacher Ross Jackson showed up at James Madison University in Virginia to rebuke the University for its sins, a group of students gathered and, led by Luke Reeping on guitar, sang John Mark McMillan’s Christian worship song “How He Loves” in response. But then I did a little nosing around. RawStory, my original source, had presented Jackson as an “anti-gay preacher,” but neither the video that RawStory linked, nor Jackson’s website support that claim. via WATCH: College students drown out street preacher’s anti-gay sermon with song about Jesus. Of course, if the Bitemaster were to run, he could spend a total of $1.00 and probably pull 10 votes for a cost per vote of only $0.10. But the Bitemaster wouldn’t get over 35% of the freaking vote, like Cuomo’s opponent, Zephyr Teachout, did. Not exactly a resounding mandate for Cuomo. Andrew Cuomo spent almost 40 times as much for his votes as Zephyr Teachout – The Washington Post. According to the Daily News, the Republican Campaign Committee had a private detective attach a GPS device to an opponent’s car to track his comings and goings. The state police say it was probably legal. Which is good news for stalkers who can now claim they were just engaged in negative research of a potential political opponent. 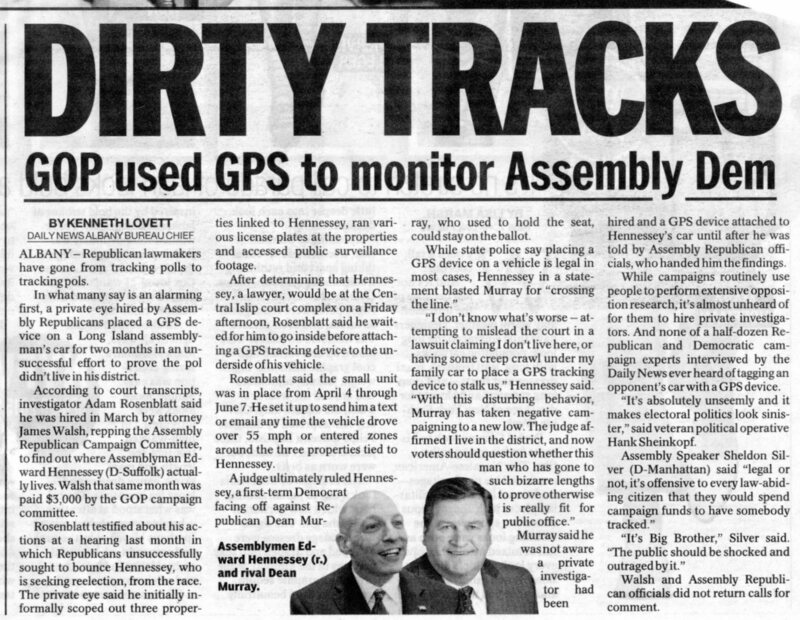 Detective hired by Assembly Republicans placed GPS on Long Island Assemblyman’s car for two months – NY Daily News. Under Commander-in-Chief Obama, you can no longer reenlist in the Air Force without swearing to God. via Air Force blocks atheist’s reenlistment for refusing to swear ‘so help me God’. On August 28, 2014, the California Superior Court for the County of Los Angeles issued its final judgment in Vergara v. California, striking down the teacher tenure protections of the California Education Code as unconstitutional. All the anti-union voices — as well as many idiot liberals — hailed the decision as a great victory for students. It was not. Reforming (or gutting) tenure laws might make it easier to weed out bad teachers, but it does nothing to address the underlying ability of segregated schools to attract and retain strong teachers. As a result, even if tenure reform is successful, there is little reason to think new teachers hired in high-poverty schools will be much better. In fact, we know of no evidence that firing bad teachers improves student performance. Our own research suggests that breaking the unions (and that’s what Vergara v. California is really about) has no effect at all on educational outcome. To read the evisceration promised above, read Joe Patrice’s column at AboveTheLaw. How do I know the article is good? Because MrMild sent me an excerpt. Should you read the article? Only if you want to give up some privacy to do so. Why the U.S. needs better privacy laws, now!. We can only hope that the gays who wanted to march in honor of St. Patrick will also show up for Mass. New York St. Patrick’s Day Parade Lifts Ban on Gay Groups – NYTimes.com.